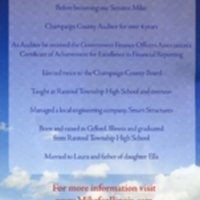 The flyer advertises Mike Frerichs as State Senator for the 52nd district in the 2010 Illinois elections. The Democrat held the office since 2006 and won 2010 with a margin of 12'000 votes against Repulican candidate Al Reynolds. Rerichs currently serves as Treasurer of Illinois, having succeeded the Republican Dan Rutherford in January 2015. The flyer positions Frerichs as a candidate concerned about job security, education and environmental sustainability. A quote attributed to Barack Obama praises Frerichs as "one of the young leaders in Illinois" with a "deep commitment to this region." Obama and Frerichs held a rally in Danville in 2006 when Frerichs was first elected as State Senator. He won that election just so (500 votes). This was the first campaign the contributor worked on. The 2010 State Senate elections in Illinois, 52nd district. Democratic candidate Mike Frerichs. 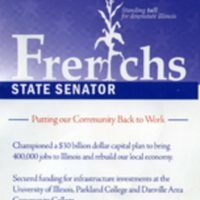 “Flyer for Mike Frerichs as State Senator,” UIS History Harvest, accessed April 18, 2019, http://uishistharv1.uis.edu/items/show/90.